You are here: HomenextPeoplenextLocal folknextThe Generation Game! I see the Generation Game was back on the small screen earlier this year, anyone fancy a game? mybrightonandhove version works like this; good evening ladies, gentlemen and children welcome to the Generation Game, nice to see you, to see you nice!! !……….you have to identify generations of the same family defined on different pages of mybrightonandhove website, the person to get the most wins, I’m going first!! Firstly you can see Harold Green in September 1925 on this page here: he looks to be in his early 50’s, so I would guess born around 1870. The old Chain Pier was still standing and Brighton extended up to the Seven Dials, not much further north. I’m not sure of the date Harold died, possibly shortly before WWII. 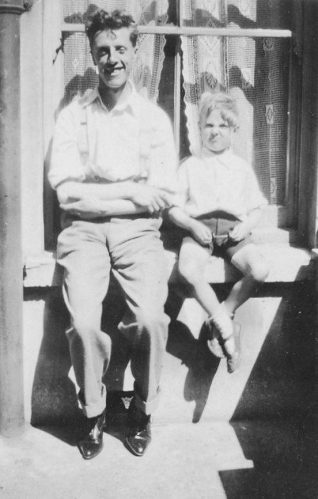 On this page Harold’s son Herbert can be seen in 1929 sitting on the window sill at the rear of No 28 Exeter Street, with his young son Geoff. Herbert was born in 1894, sadly he died quite young in 1942 at the age of 48, probably not long after his father Harold! Although the very young “cheeky” Geoff Green can be seen on this page, later in life he had a more serious side. In addition to the happy young Geoff on this page, he has a page of his own which you can see here Geoff was born in 1923, you can read about his WWII exploits and life on his page, sadly he passed away in 2006. Derek Green was born in 1954; he’s been a steam enthusiast since a very young age; you can see him here (middle row 3rd from left) in Hove Park with the fledgling Brighton & Hove Society of Model Engineers. The society was founded in 1951 and it still runs today almost 70 years later. Fortunately Derek is also still with us almost 65 years later, in fact he’s nearly as old as steam itself!